Public Square Films, 120 minutes, Not-rated. When A.I.D.S. first showed up in 1981, diagnosis was a death sentence. That was just fine by conservatives such as Ronald Reagan, Jesse Helms, and George H. Bush, who were willing to see it as God’s punishment upon immoral homosexuals. And then Rock Hudson died of the disease and Magic Johnson contracted it. So too did heterosexual men and women. When middle school student Ryan White, a hemophiliac, came down with AIDS, even bigots found it expedient to keep their mouths shut. Inexorably, the stigma attached to AIDS began to erode (though they never disappeared totally). Millions perished, but by 1995, an effective drug cocktail treatment plan was in place that dramatically prolonged the lives of HIV positive individuals. As David France’s Oscar-nominated film shows, don’t applaud science–give the credit to the activists that forced drug companies, public officials, and the National Institutes of Health to research the disease, end the demonization of homosexuals, and speed clinical trial approval. France’s film centers on New York City and the activities of ACT UP and TAG (Treatment Action Group). It’s not an easy film to watch and its graphic images of final-stage victims are often sickening. It’s positively heartbreaking to watch the transformation of ACT UP spokesperson Bob Raferty from a robust beefcake to a deathbed stick figure in just three years. Nor is it comforting to contemplate that AIDS still has no cure and that millions still die because they can’t afford the medicine that can save them. We care deeply about Raferty because filmmaker David France understands the need to personalize the AIDS crisis. Just as Hudson, Johnson, White, Freddie Mercury and a few other high-profile cases awoke the collective conscious of a nation, so too does France take New York’s large gay community and personalize AIDS by focusing on a handful of individual stories. Call it an Olympics profile style if you will, but it’s effective. Segments are linked by flashing each new year while a counter of AIDS-related deaths clicks away in the background. France’s technique puts human faces to otherwise sterile numbers. 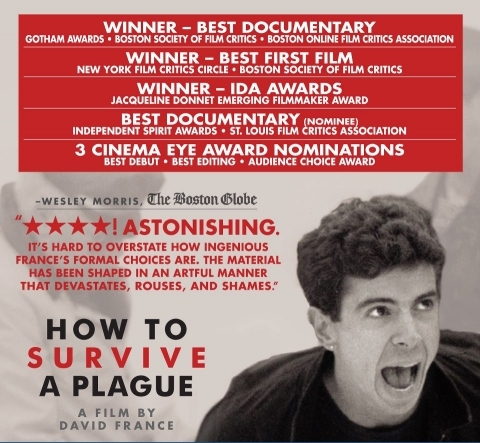 How to Survive a Plague tackles a depressing subject, yet it’s ultimately upbeat and inspiring. Among its many virtues is that it demonstrates the power of citizen advocacy at a time in which cynicism over the efficacy of politics is skyrocketing. Think individuals can’t make a difference? Tell that to activists who recall the day they met Iris Long, a frumpy straight housewife from Queens. She also happened to be a trained chemist and righteously angry that people were dying and nobody was doing anything about it. She appeared at an ACT UP meeting, told the mostly male crowd that they didn’t know what they were talking about, showed them how to put science into their rhetoric, and challenged them to develop their own treatment plan if nobody else would. From her challenge, TAG was born and, by the early 1990s, the NIH, Merck, and others wanted TAG representatives on their boards. Take a deep look inside 1960s posters. If you’re going to Smith College before September 15, be sure to wear some flowers in your hair. By all means, be sure to see the colorful–and I do mean colorful–exhibit “Summer of Love: Psychedelic Posters from the SCMA.” As advertised, it’s a collection of great rock posters, most of which come from the San Francisco Bay area from the 1967 Summer of Love. It features works from acclaimed graphic artists such as Alton Kelley, Rick Griffin, Bonnie MacLean, Peter Max, Victor Moscoso, Stanely Mouse, and Wes Wilson. The SCMA show is divided into several major sections: aesthetics, the counterculture, drugs, and music. One side exhibit features a few black light posters, and another is a running video loop of outtakes from the 1967 Monterey Pop Festival, which was the era’s musical signature event–Woodstock’s outsized reputation notwithstanding. (It will also remind you what an amazing band The Byrds were.) The explanatory texts are insightful, though I do have quibbles with curator Aprile Gallant’s incomplete take on the counterculture. The counterculture comes off as too much about LSD and hippies (Ginsburg, the Human Be-In, acid tests) and not enough about politics. (Where are the Diggers? The San Francisco State and UCal Berkeley student protests? The antiwar movement?) To be sure, the Summer of Love had a turn-on vibe, but by the fall the party petered out and other issues rose to prominence. Can we finally get it straight and understand that hippies were a small part of the counterculture, not its essence? Reminder: This show closes September 15, and then the Age of Aquarius goes back into storage. Postscript: More images from this exhibit can be viewed on my Facebook page.